An enchanted love, an eternal vow, a prince sent to battle, and a maiden who awaits his return… As spring approaches, she covets her prince’s homecoming and his eternal love. This is The Royal Promise, and in this fairytale romance, majestic music and alluring animations enhance a truly captivating game experience. 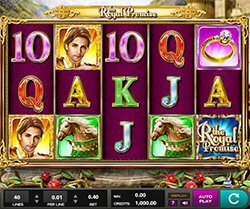 This 40-payline free slots game comes to you from IGT and High 5 Games and gives you plenty of opportunities to hit a royal jackpot! The Royal Promise showcases Super Stacks, a proven feature that can lead to monstrous wins. With Super Stacks, long stacks of symbols are more prone than ever to show up on reels to create big wins. The game also offers the Pick-A-Super-Stack feature, which gives you the choice in the free-games bonus. On the reels of this colorfully illustrated game you’ll find the princess, a royal steed, diamond rings, a prince, the game’s logo, and card symbols ten through ace. Royal Wilds – The Game’s logo is the Wild symbol in this game and substitutes for all symbols except the ruby emblem scatter to complete winning combinations when possible. Super Stacks – At the Start of each game, the reels contain stacks of symbols that transform into one of the games many symbols. All stacked symbol positions on a reel transform to the same symbol and offer up great opportunities to hit multi-line wins. Note that the emblem scatter appears only on reels 2, 3 and 4. Free Games – You can earn 7 free games when you land the Ruby Emblem scatter symbol in all positions on reels 2, 3 and 4. It is a scatter symbol but being that the rows are three symbols high, you’ll need a total of 9 of these symbols to trigger your free games.